Our friends at the Mayor’s Alliance for NYC’s Animals sent word this morning that you can now get certified in TNR through the Humane Society University Online. Of course, the best way to learn how to properly use a trap is to practice with one physically, but TNR is about more than just trapping. The online course will teach you how to reach out to the community and educate people about the purpose of TNR and how it can make life better, not just for the cats, but for the whole community. This course will teach you how to help solve the problem (of feral cat overpopulation) by using the Trap-Neuter-Return (TNR) approach to managing feral cat colonies. 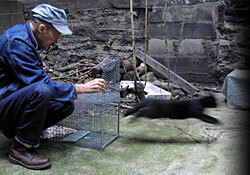 This innovative technique involves trapping the cats in a colony, having them neutered, vaccinated against rabies and marked for identification, and returning them to their territory. A caretaker then provides regular food and shelter and monitors the colony over time. With TNR, the cats reproductive capacity is eliminated, leading to a gradual decline in their numbers, and nuisance behavior is substantially reduced. The course will describe each step in the TNR process in detail, including working with neighbors and the community at large, feeding, setting up adequate shelter, arranging for spay/neuter, trapping (including preparations, equipment and techniques), caring for the cats while theyre confined, and other feral cat issues like rabies, wildlife and relocation. In addition, the course will discuss why TNR works to reduce feral cat numbers and why other methods, such as trap and remove, have failed. The course only costs $10, although the Mayor’s Alliance may be able to get you signed up for free. Please e-mail info@animalAllianceNYC.org to find out if the offer is still available. Saturday marks the start of the 3rd annual NY Week for the Animals (well, a tad more than a week really). For nine days more than 100 events will be held state-wide to celebrate our four-legged friends. Upcoming events of note include CPR and first Aid training provided by Bide-a-Wee, and the “Fall Fix” spay/neuter clinic hosted by the ASPCA/Mayor’s Alliance, both being held tomorrow, October 1st. Please click the photo for more info and a full calendar of events.